Get ready to experience dining in a way this city never has before. Dark Table specialize in serving up culinary adventures that will allow your senses of smell, taste, and touch guide you. Do You Dare to Dine in the DARK? the flavors of your meal—the way dinner is meant to be enjoyed. how life would be like without relying on your vision. A dining experience unlike any other is opening its doors this fall in downtown Calgary. Dark Table will change the way you taste and think about food. Millions of people live with blindness every day, relying on senses other than their eyes to navigate the world around them. For a sighted person, imagining what it would be like having to complete everyday tasks without the aid of sight may seem tough to imagine. To get just a small understanding, try eating a meal in complete darkness. That’s where Dark Table comes in. The experience is meant to enhance your less dominant senses like smell and taste, while at the same time offering awareness on what it’s like to live without sight. The concept has been proven incredibly popular in major cities like Montreal, Vancouver, London, Paris, Zurich, New York, and Los Angeles. “It is a very unique dining experience and gets you to appreciate your vision,” said owner and founder of Dark Table, Moe Alameddine. The first thing you’ll notice when arriving at Dark Table is how different it is from your average restaurant outing. Guests are welcomed in a lighted lounge area, where menu selections are made. When ready, a blind or visually impaired server called a guide server will lead your group to a table in complete darkness. Once seated, your guide server describes where you can find everything on your table and how to access the lighted bathrooms if needed (with the assistance of a blind server). No cellphones, watches, or other light-producing technologies are allowed in the dining room. Without the sense of sight, the senses of touch, taste, hearing, and smell are intensified. Diners are even encouraged to eat with their hands if utensils start getting in the way. Dark Table is a proud employer of the visually impaired. With an unemployment rate of 70%, the blind face obvious challenges in Canada. 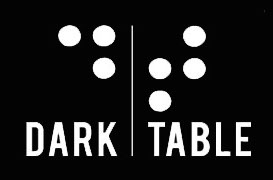 The only servers who work at Dark Table are visually impaired. Copyright © Dark Table Restaurant 2017.